DEMOGRAPHICS & In booming Austin, Texas, churches struggle to keep pace with the city’s growth. by Eileen Flynn, Faith and Leadership Magazine, 3/19/19. At a time when many churches in the United States are struggling, some even dying, a counternarrative is playing out in booming Austin, one of the fastest-growing cities in the nation. 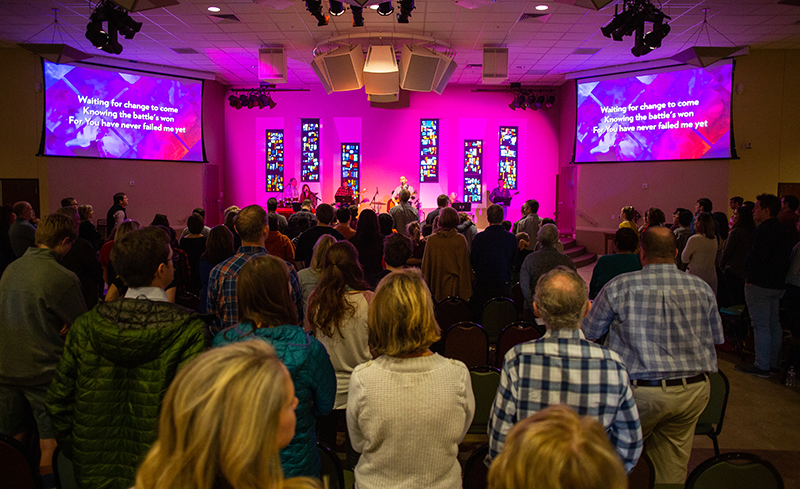 Though not all of Austin’s congregations are thriving, some area churches are clearly being squeezed by the region’s population explosion over the last decade. And while packed pews are a cause for celebration, the rapid growth presents challenges, and perhaps even a few lessons — lessons about hospitality, welcome and community in an era of increasing isolation. To accommodate the growth, church leaders have added more worship services and programs. They’ve expanded or built new sanctuaries. Some have gone multisite — often digitally streaming sermons from a main location to satellite campuses in the suburbs. They have planted churches like The Well that meet in school cafeterias. And they have created more small groups so members don’t feel overwhelmed. “Whether there’s a higher percentage of Austin population attending church now than before — I suspect not,” he said. SYSTEM 2 of 7SYSTEMS.church: RECONCILING & How to reach a growing culture. This is second in a series of articles by Bob Whitesel, D.Min., Ph.D. (5/24/16) introducing the 7SYSTEMS.CHURCH and which first appeared in Church Revitalizer Magazine. To revitalize a church, we must first understand what we are revitalizing it into. This article is the second in the series investigating the “7 Systems” of a healthy church (www.7systems.church) that describes what a revitalized and healthy church looks like. These seven characteristics are drawn from the exhaustive research in Hartford Seminary’s: “American Congregations Study” (available free at http://www.FaithCommunitiesToday.org). While the survey is long, I have broken it down into seven categories of a healthy, revitalized church. In the series’ first article we looked at “visibility.” Healthy churches are visible either through location or by making an impact in the community. In that Church Revitalizer magazine article you will find ideas to increase physical visibility, social media visibility and member visibility. This article will look at how to reach out to a new, but growing culture. That’s right, most revitalized churches have looked around them and seen what cultures are emerging in the community and they have reached out to them one at a time. There are many different types of cultures. Most churches already have some experience reaching out to different age cultures. For example, many aging church have looked around and seen younger people moving into the area and reached out to them. But most churches are less experienced with reaching out to different ethnic cultures. For instance, congregations today are increasingly looking around and noticing that people who speak a different language are moving into the community. Most church do not (yet) have ideas about how to reach out to a ethnic culture. But read on, for this article will show you seven steps to reaching a new and different culture. In the above scenarios, a church realizes that the culture that comprises the existing church is not the growing culture in the community. And the church realizes in order to be healthy, it’s existing leaders must help the church transform into a church that represents the growing culture in the community. This is done in seven field-tested steps first suggested by Harvard Business School professor John P. Kotter. 1. Communicate the urgency. The congregation must realize that it has to reach a growing culture or die with its existing culture. This must include studying the behaviors, ideas and traditions of the new culture. While some aspects of a culture can run counter to the Good News, other aspects may not. Leaders have to do what Eddie Gibbs calls “sift a culture.” He uses a colander metaphor to describe how mature leaders must sift out the impurities that run counter to the Good News, while retaining the good. 2. Create a guiding coalition. This means partnering with leaders from the emerging culture. One of the best ways to do this is to look for what the Bible calls “persons of peace” from the emerging culture (Luke 10:6). The biblical word for peace comes from the Greek “to join” and indicates a person who unites people from divergent cultures. So, look for people who are “peacemakers” with a demonstrated ability to bring different people together. They are usually recognized as a leader or at least an informal influencer in their culture. Begin by looking for them, then invite them to bring along several of their colleagues to help you understand and plan ministry to this culture. 3. Create a vision. This coalition creates a vision to help people visualize what the church will look in five years. This can be a descriptive paragraph depicting what a revitalized and intercultural church might look like. 4. Communicate the vision. You can’t just make a vision statement, you need to regularly in sermons and then Bible studies, stress what the church will look like in the future. Painting the picture over and over again is critical. Research also shows that you are almost three times more likely to change if you attach a story (such as a biblical story) to the change. 5. Empower others to act on the vision. This means beginning to give people from the other culture permission to lead. It also means experimenting with and supporting new ideas from that culture. Because the vision has already been cast and promoted, people are more willing to experiment and try new ideas. 6. Celebrate small wins. After you experiment (in step 5) you will then want to celebrate small wins. Perhaps opening up your facility for use by another culture or if you can afford it hiring a person of peace from that culture to be a minister to that culture. Churches customarily do this by hiring a youth minister to reach out to younger generations or a Hispanic Spanish-speaking minister to reach out to the Hispanic community. When fruit results, no matter how small, you must celebrate it. This gives people an opportunity to see progress. 7. Create bigger and better wins. Don’t be satisfied with small wins, but use them as a stepping stone to more progress. Here is a key most churches overlook, because once they have some success they stop. Church revitalization will stall unless you keep a church moving forward. So, keep pushing ahead for bigger and bigger wins … but have tact and don’t go too fast. Too often churches are satisfied with small changes, but long-term health requires a continued expansion of bigger and better changes. POLARIZATION & New research-based book describes 7 political “tribes” of Americans & their percentages. by Yascha Mounk, The Atlantic, 10/10/18. …According to the report, 25 percent of Americans are traditional or devoted conservatives, and their views are far outside the American mainstream. Some 8 percent of Americans are progressive activists, and their views are even less typical. By contrast, the two-thirds of Americans who don’t belong to either extreme constitute an “exhausted majority.” Their members “share a sense of fatigue with our polarized national conversation, a willingness to be flexible in their political viewpoints, and a lack of voice in the national conversation. 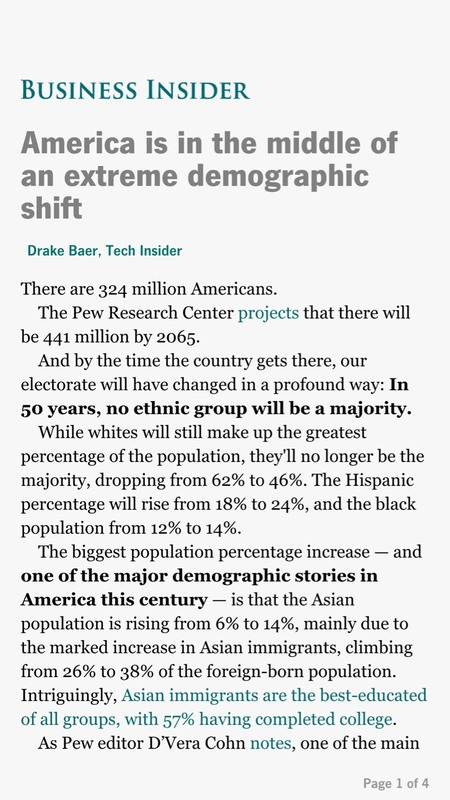 Commentary by Dr. Whitesel: In 50 years, no ethnic group will be in a majority. Yet, there will be even more cultures than there are today. Why? And, who is the fastest growing demographic? Read this insightful article based on Pew Research from Business Insider magazine. by RAKESH KOCHHAR, Pew Research, 7/16/15.